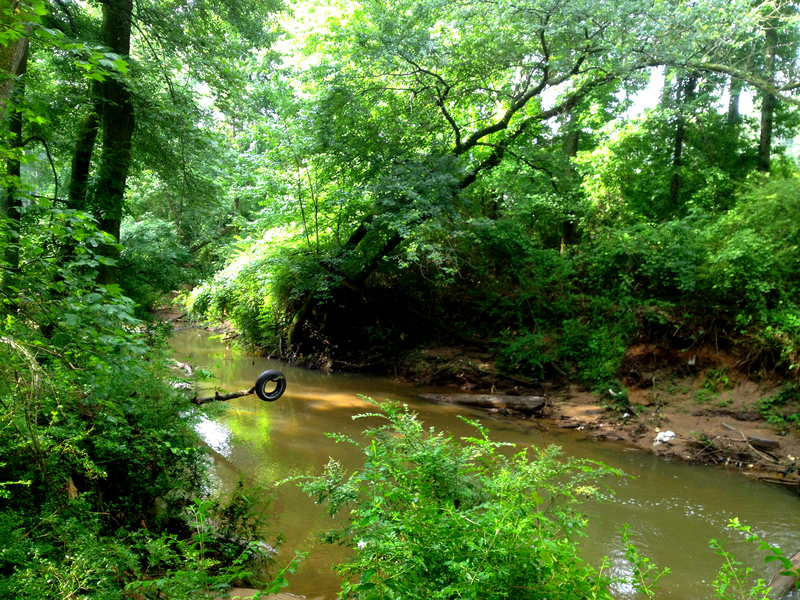 In southeast Atlanta lies a nature preserve unlike any other in Georgia. 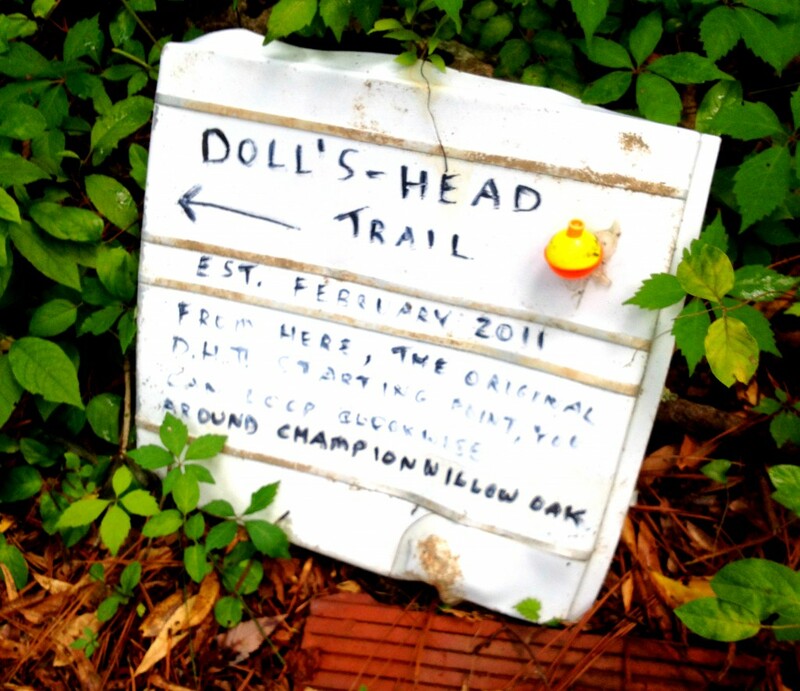 Doll’s Head Trail at Constitution Lakes Park is part wildlife refuge, part hiking trail, part snake pit and part art exhibit. 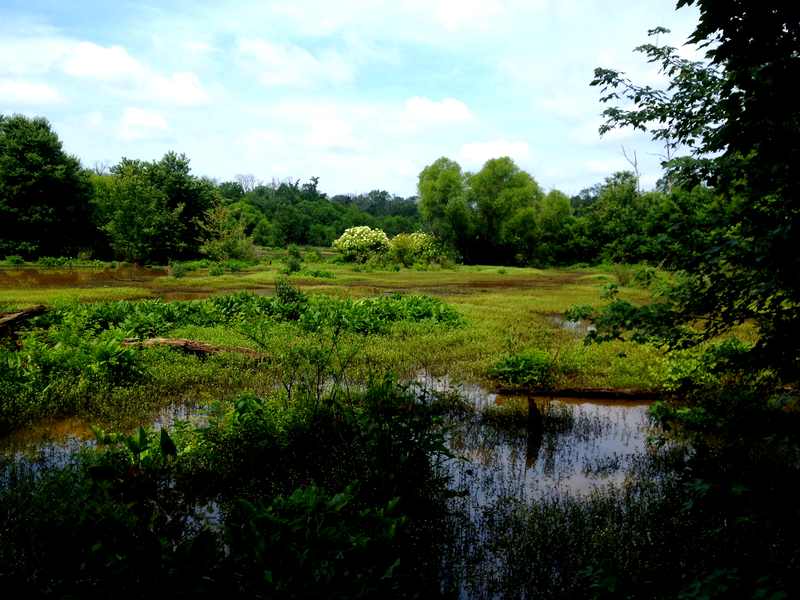 The land has been transformed by both humans and the flooding South River into an ecological sanctuary smack in the middle of an industrial district. 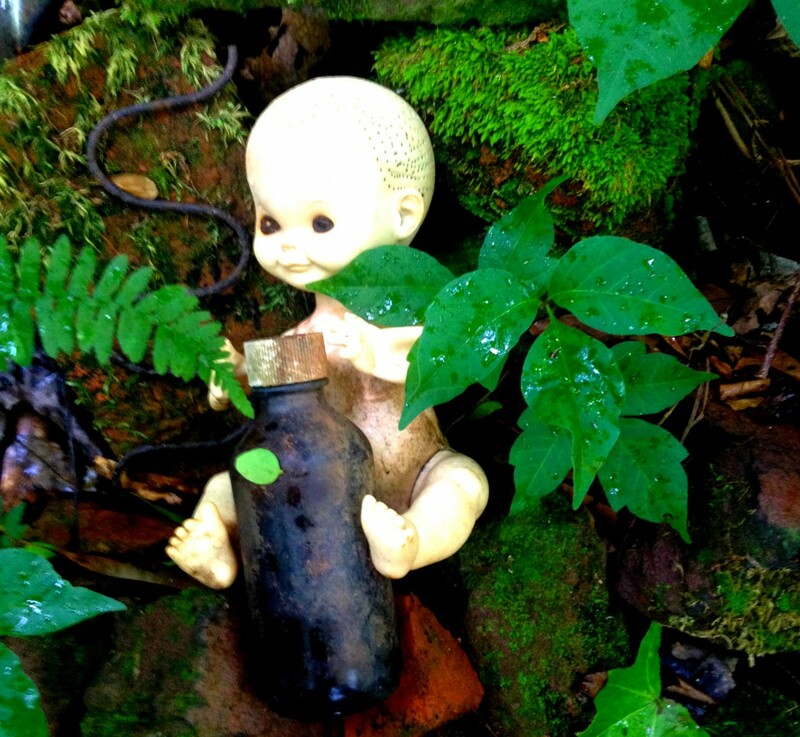 It’s called Doll’s Head Trail because of the in situ artwork created with trash, many of it doll heads, that is left over after the South River floods. At the center of the park lies two small lakes that were formerly excavation pits created by the South River Brick Company digging out the soft red clay for bricks. It’s a must visit for Atlanta art lovers, urban explorers, birders, fishermen, tree huggers, history buffs and nature geeks. But if you head out there watch out for copperheads and deer ticks. Seriously. You can find Constitution Lakes at the intersection of South River Industrial Boulevard Road and Moreland Avenue right inside the perimeter. 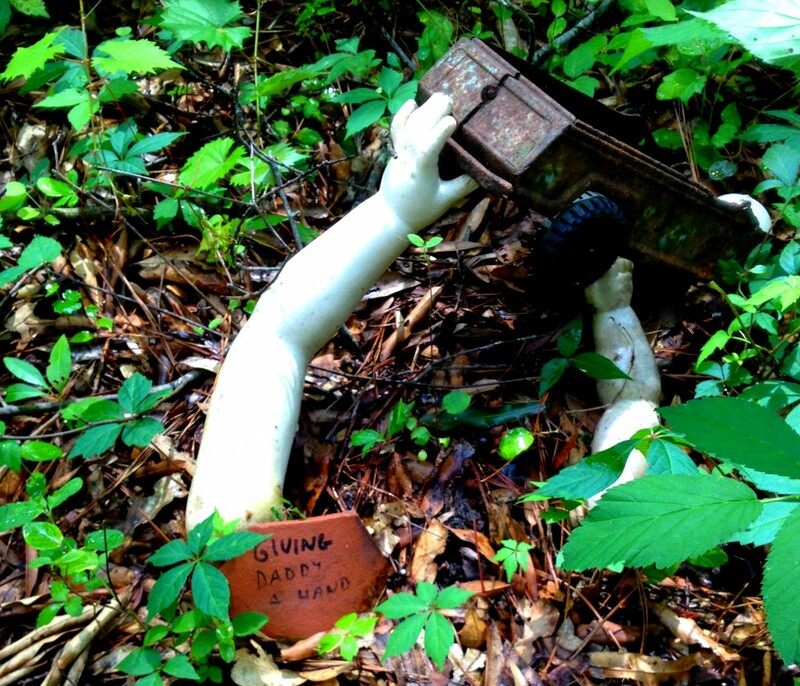 Doll’s Head Trail is a little harder to find. It’s a not-challenging, sometimes whimsical hike that’s worth the trek. 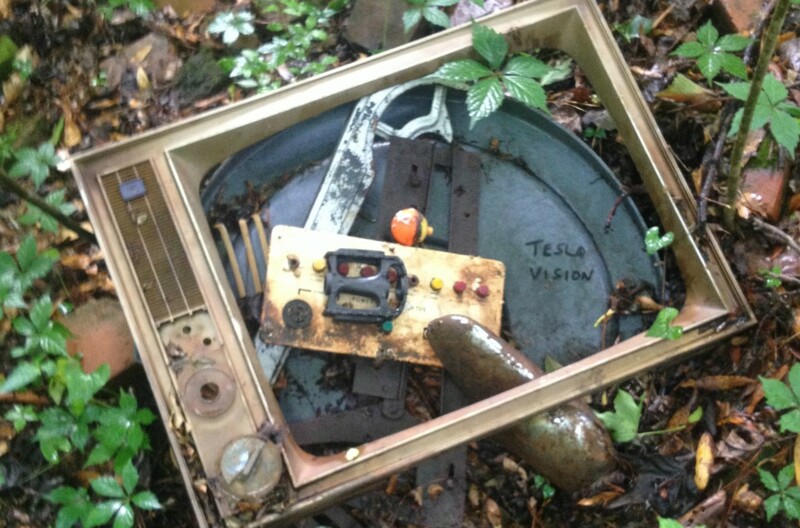 As you can see from the pictures, visitors are encouraged to create artwork from the bottles, old televisions, sheet metal, terracotta tiles, bricks and doll heads that litter the trail. 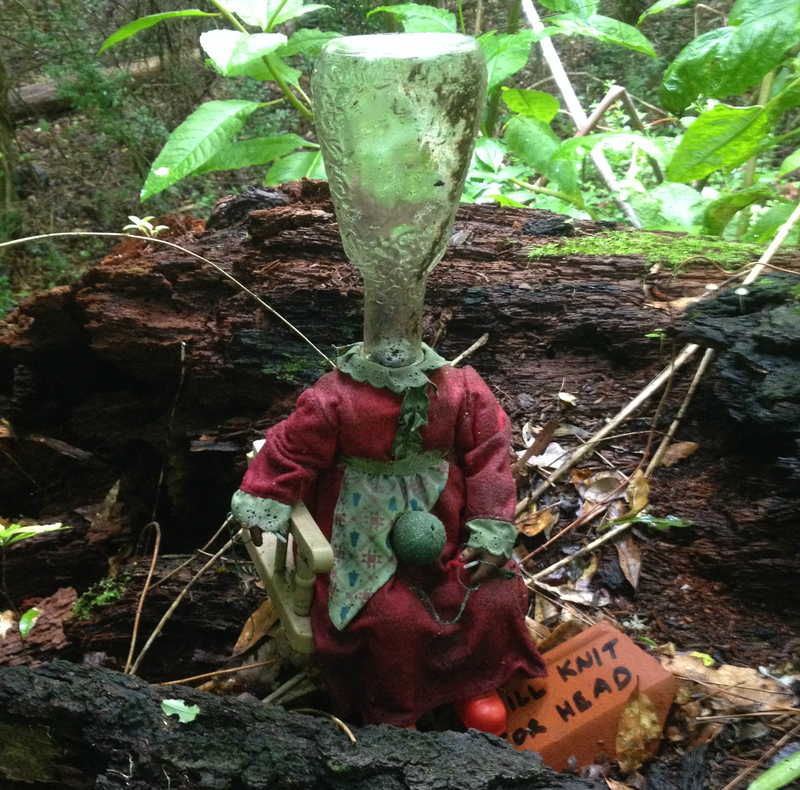 This detritus-laden Doll’s Head Trail can be found hidden away, back behind the two lakes in a spot accessed by the Rail Ridge Trail. Hikers have to traverse the northern lake by taking a boardwalk that curves around the north side of the shore. 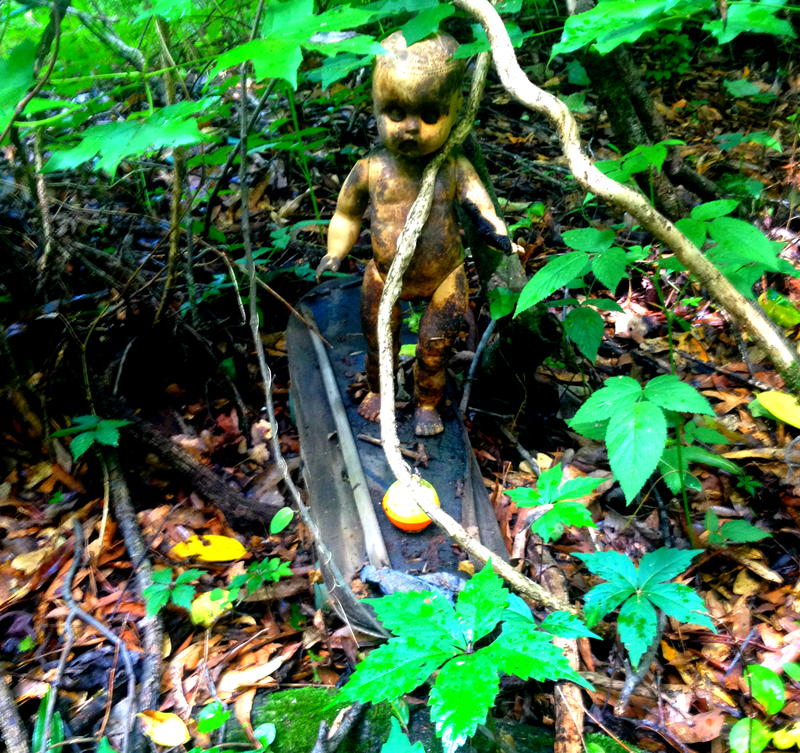 But as you exit the boardwalk you’ll discover a wonderful trail filled with artwork, massive trees growing out of piles of abandoned bricks, turtles laying eggs, croaking frogs, the remnants of abandoned homesteads and a beautiful marshland scene all inside the perimeter. Constitution Lakes is a 125-acre park operated by DeKalb County. It was purchased for $1.28 million in 2003, I believe with cash from Arthur Blank, and it’s worth the visit. 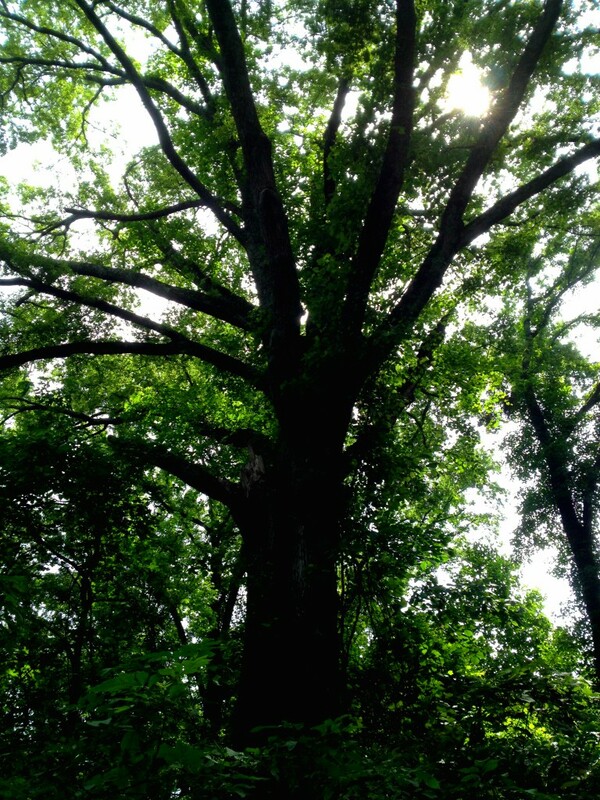 Particularly for birders, fishermen and individuals interested in dendrology (that’s the study of trees). 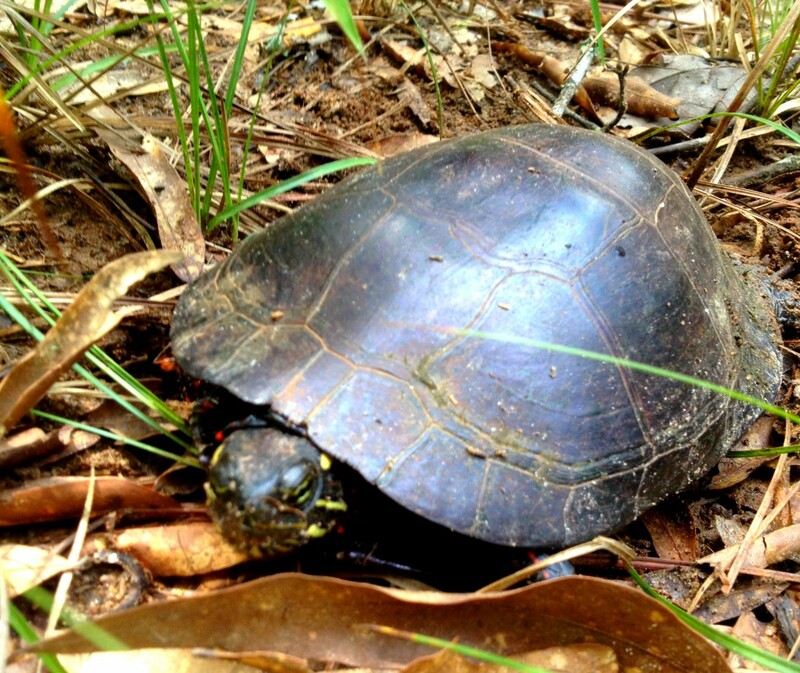 The lakes feature countless turtles, crappie and catfish, along with large mouth, small mouth, spotted and striped bass. For bird watchers, you’ll see belted kingfishers, woodpeckers, ducks, blue herons, geese, hawks and more. It’s a breathtaking biological smorgasbord with towering sentinel trees surrounded by trucking outfits, pallet sellers, rough neighborhoods and even a transitional center. The land itself offers an enlightening glimpse into Atlanta history, stretching back to before Hernando de Soto blindly stumbled through Georgia in 1540 searching for cities made of gold. But before we dive into the history, let’s talk about how you can help Constitution Lakes now. While it did recently receive $12,500 to improve the trails, Constitution Lakes requires donations and help from volunteers like you to survive. And there are several groups and people responsible for this hidden gem most residents of Atlanta have no idea even exists. 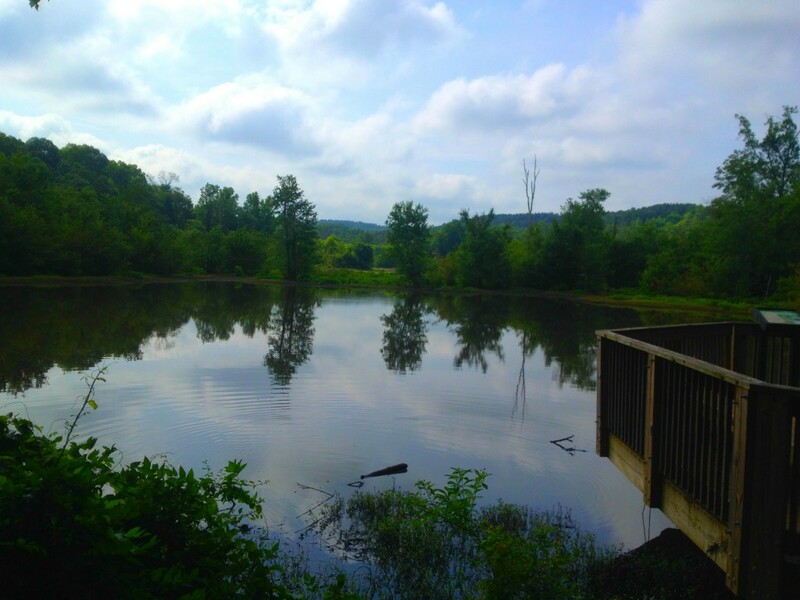 First, visit the Friends of Constitution Lakes and like their Facebook page – they regularly organize volunteers to pick up trash and help clear the trails. 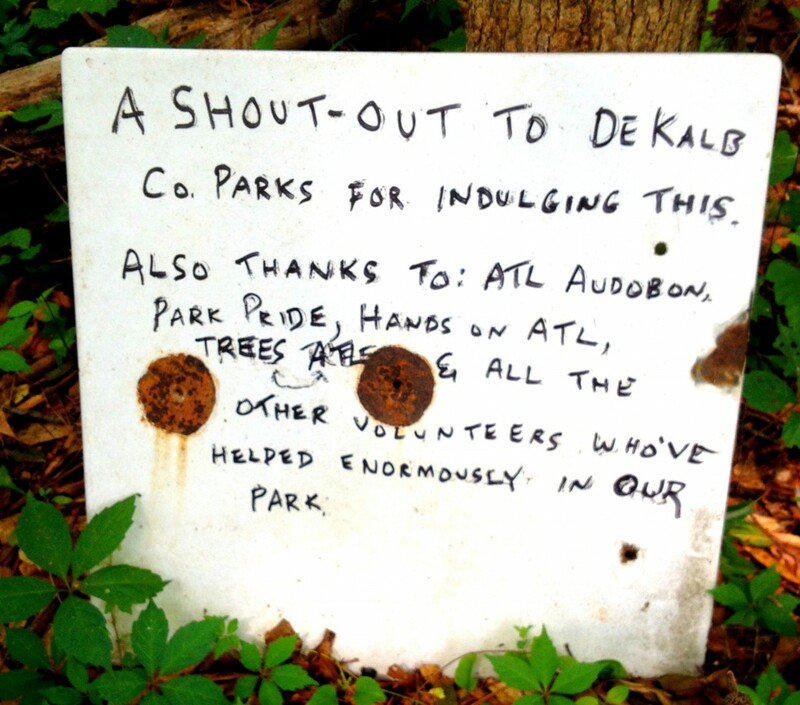 Second, go to the Park Pride website and make a donation to this non-profit dedicated to Atlanta parks – they put up $10,000 in December of 2013 to help Constitution Lakes. 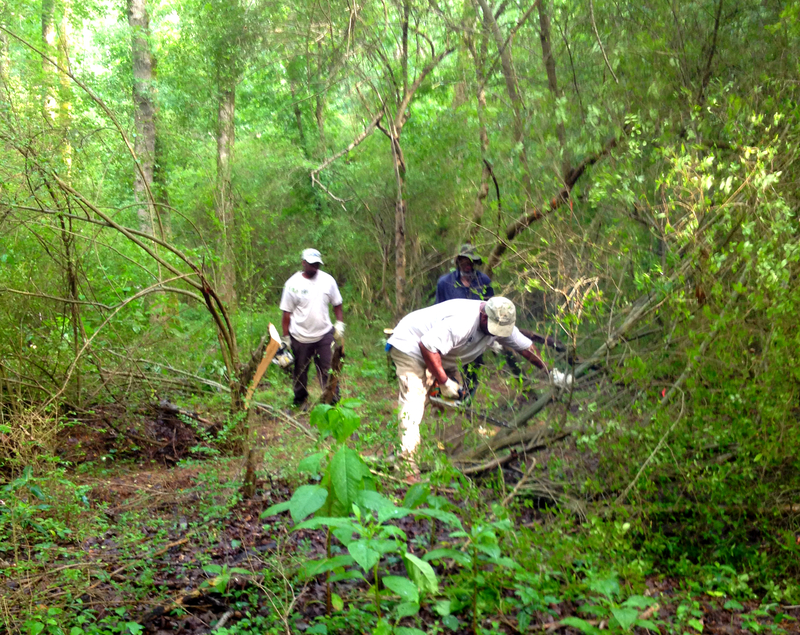 Third, check out the Atlanta Audubon Society – Atlanta President Joy Carter has been instrumental in saving this piece of land for all of us to enjoy. And fourth, support DeKalb County Parks, for they control this beautiful tract of forest in an otherwise urban environment. It’s appropriate the lakes were created by mining, for the area has been exploited by man for thousands of years for natural minerals. For those not familiar, Constitution Lakes is near Soapstone Ridge, a 25 square-mile area that offers dozens of Late Archaic quarries and workshops that were the epicenter of a huge trade network. What did they trade? The focus was soapstone, a rock that offers a greasy and soapy feel, hence the name. Around 3,000 B.C.E. man would quarry soapstone into slabs that were used for cooking over fires. 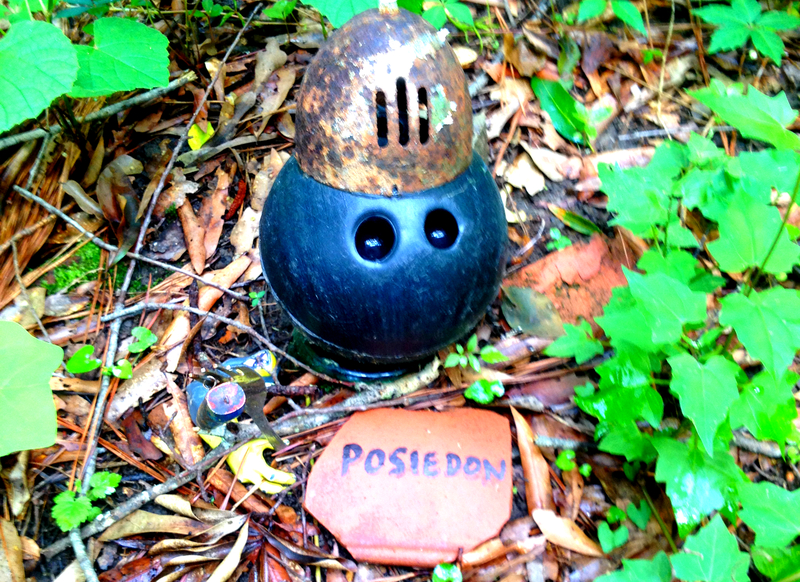 In southeast Atlanta in the area surrounding Constitution Lakes there are dozens and dozens of sites dedicated to the production of soapstone slabs. 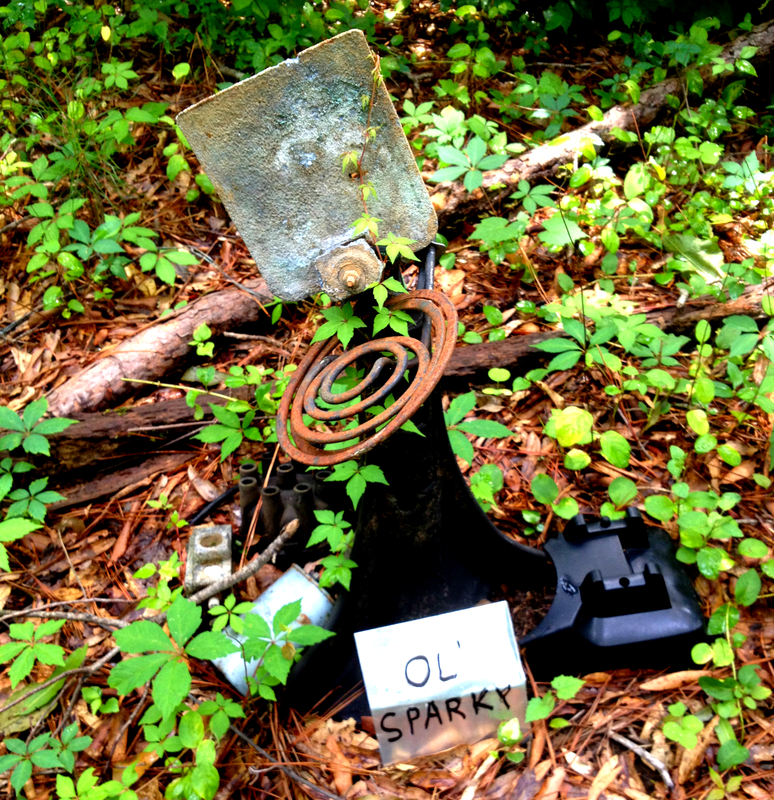 Since the 1970’s archaeologists have identified 12 quarries in Soapstone Ridge, 12 around Conley Creek and nearly 25 buried by the Live Oak Landfill. These quarries and shops created more than just the soapstone slabs, but atlatl weights, net sinkers for fishermen, smoking pipes and ornaments. Many of these sites have been wiped out by subdivisions, the landfill and other developments. And when I say a huge trade center that could be an understatement. The soapstone slabs created in southeast Atlanta have been found as far east as Louisiana and as far north as the Great Lakes. Think about that for a moment. It was before horses, when the dog was the only pack animal in North America. Most of these goods were transported on people’s backs. It was an incredible trade network that created immense wealth for the groups that controlled it, and at the center was southeast Atlanta. That was until clay pottery came on the scene around 2,500 B.C.E., and soapstone was slowly phased out until it mostly disappeared by 1,000 B.C.E. (Native American groups until quite recently would use soapstone for smoking pipes, but that’s about it). Recent studies of the area that now holds Constitution Lakes have not found any evidence of this type of activity. Logging activity and farming would have removed much of the evidence. And most of the land lies underwater due to the brick excavation pits created by the South River Brick Company. 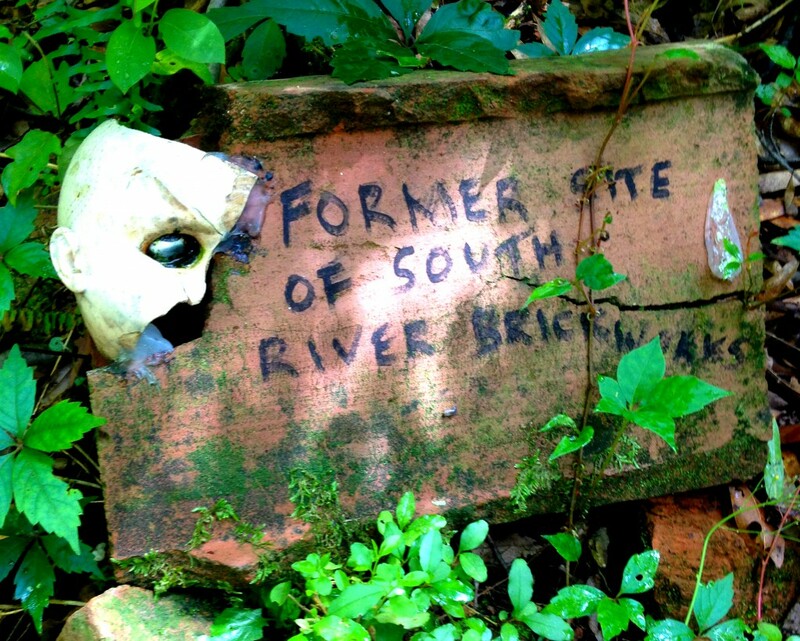 The story behind the South River Brick Company in DeKalb starts before the Civil War when Killis Brown, the son of a blacksmith and farmer from Entrenchment Creek, purchased Land Lots 49 and 50. Within Land Lot 50 was what would become Constitution Lakes. In 1867 Killis sold 101.25 acres to each of his children – his son Allen Brown bought his piece of the pie for $300, and it included this tract of land (the western half of Land Lot 50). In 1881 the East Tennessee, Virginia & Georgia Railroad purchased a right of way through a portion of Allen Brown’s estate. They built a railroad tract that still exists today – this line creates the eastern boundary of Constitution Lakes Park. The railroad was crucial to the development of the land – it was the railroad and the clay that attracted J.R. Knapp and S.F. Cain to this piece of DeKalb County in 1892. In that year the pair formed the South River Brick Company (Knapp was president) and purchased nearly 51 acres from Allen Brown for the purpose of creating a brick works. It was the excavation pits from this brick works that are now Constitution Lakes. “There is no doubt that an effort is now being made by the convict labor brick men to freeze the free labor brick men out of the market,” said South River Brick Company President J.M. Stephens in an address to the Atlanta City Council in February of 1897. Stephens was defending the Culberson Anti-Convict Labor Ordinance, which would require all city contracts to be made with companies that used free labor only, not convict labor. And the “convict labor brick men” solely focused on one opponent: the Chattahoochee Brick Company, operated by ruthless businessman and former Mayor of Atlanta James W. English. James W. English’s story is filled with irony. I say irony because English started his professional career after the Civil War in Atlanta carrying bricks for 50 cents a day. It was a rough and sweaty job, and the Civil War veteran saved up pennies and began purchasing real estate in the recovering city. This was the key to his initial success; he used the money he made from Atlanta real estate to start the convict-labor Chattahoochee Brick Company in the 1880’s. He also invested in railroads and even started a turpentine outfit. There are a few individuals that benefited from the convict lease system, and English was certainly one of them. He was a stakeholder in two of the three convict lease companies in the state of Georgia. And this is where the irony kicks in. English’s brick company, once located where Marietta Boulevard crosses the Chattahoochee River, had hundreds of these convicted workers. So what he once did, toiling in the hot Georgia sun for 50 cents a day carrying bricks, he later in life had others to do for free and exploited the benefits. Nearly 90% of convict workers in Georgia at this time were African Americans arrested for various crimes, some of the crimes quite harmless, such as vagrancy. And vagrancy could earn you years of working in one of English’s camps. 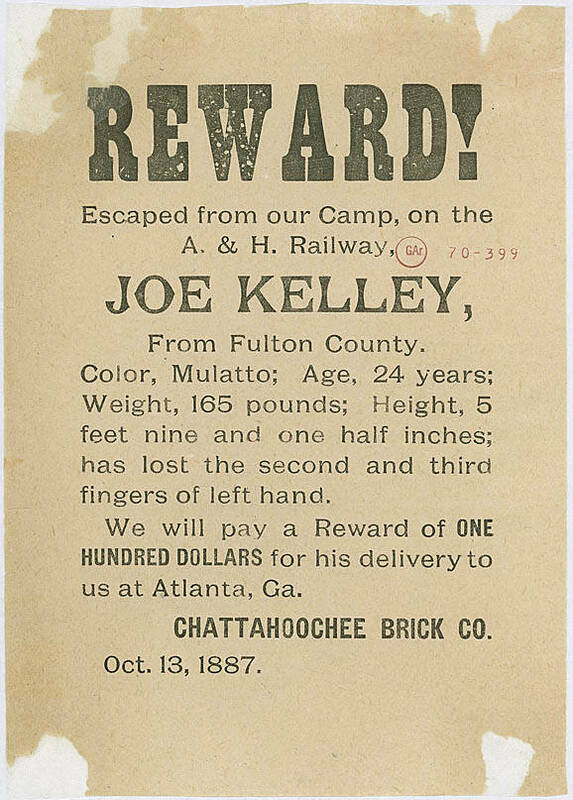 It was a brutal environment that produced, by some estimates, nearly 30 million bricks for Chattahoochee Brick between 1900 and 1909 and numerous convict deaths. The use of convict labor changed the competitive landscape of Atlanta brick making. According to English himself, the price of brick when he started his convict-labor outfit was $16 per thousand; in the space of 15 years the price had dropped down to $6 per thousand. English would respond to competition by dropping his prices further and further down. Stephens, the president of South River after Knapp, complained that when they entered the market in 1891 the price per thousand for brick was at $9, and through competition Chattahoochee brought that price down to below $6 by 1897. The Culberson Ordinance was aimed at stopping this price war, allowing free labor companies such as South River Brick and Collins Brick to compete with English’s convict-labor Chattahoochee Brick. English openly mocked the attempt, calling the ordinance “amusing”, since convict labor meant “more brick and more buildings” for Atlanta. Convict-produced brick from Chattahoochee was used in the Kimball House, the Georgia State Capitol, the Chamber of Commerce and countless other buildings and sidewalks throughout the city. But South River still competed with Chattahoochee, despite lacking the advantage of the almost free labor force. By 1897 South River Brick was producing nearly 7 million bricks a year. South River Brick was used in many city contracts, such as the Atlanta sewers installed during the 1890’s. And this success continued through the early 1900’s. They supplied 3 million of their highest grade brick for the Candler Building in downtown Atlanta, and they shipped their product to all of our neighboring states. South River Brick Company had two production facilities, one in what would become Constitution Lakes, and another in Bolton (northwest Atlanta) on the Chattahoochee River. 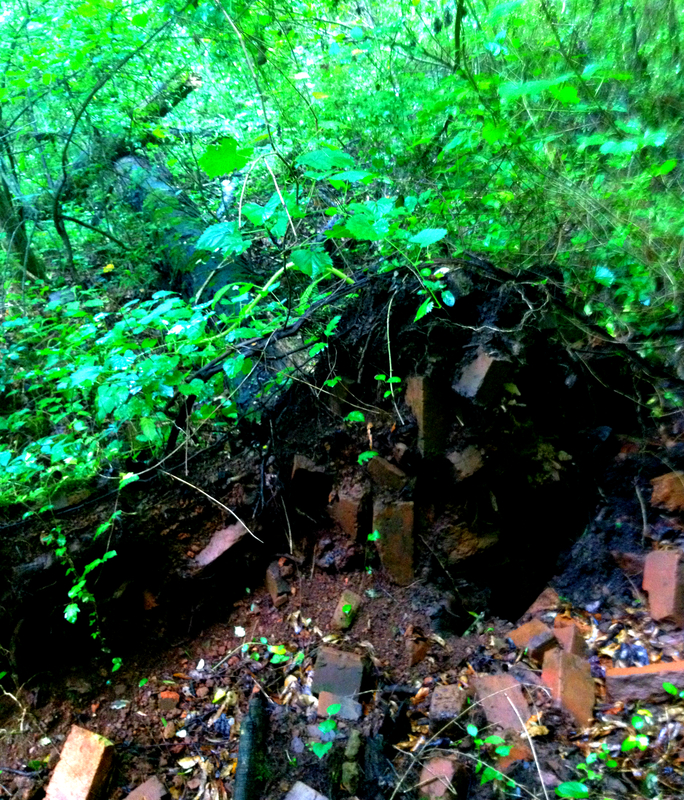 The only other major players in the brick game at the time were Collins Brick and Palmer Brick; Palmer would eventually be absorbed into Chattahoochee Brick by English. So that’s exactly what English did. In late 1902 he purchased nearly 500 acres, all of it surrounding the South River Brick Company’s location on the South River. It effectively made a roadway cut by Allen Brown through the land useless. But South River Brick also had the other facility in Bolton. Records indicate it grew larger than the South River location; between the two by 1905 South River Brick could still produce 100,000 bricks per day. They were English’s largest competitor. 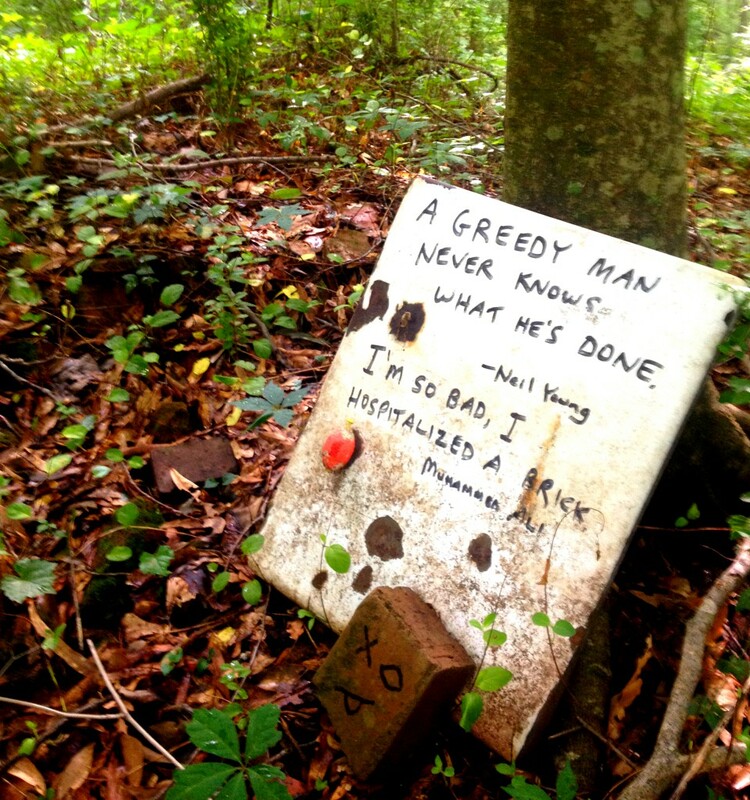 Serendipity (or perhaps arson) helped English destroy the free-labor South River Brick. 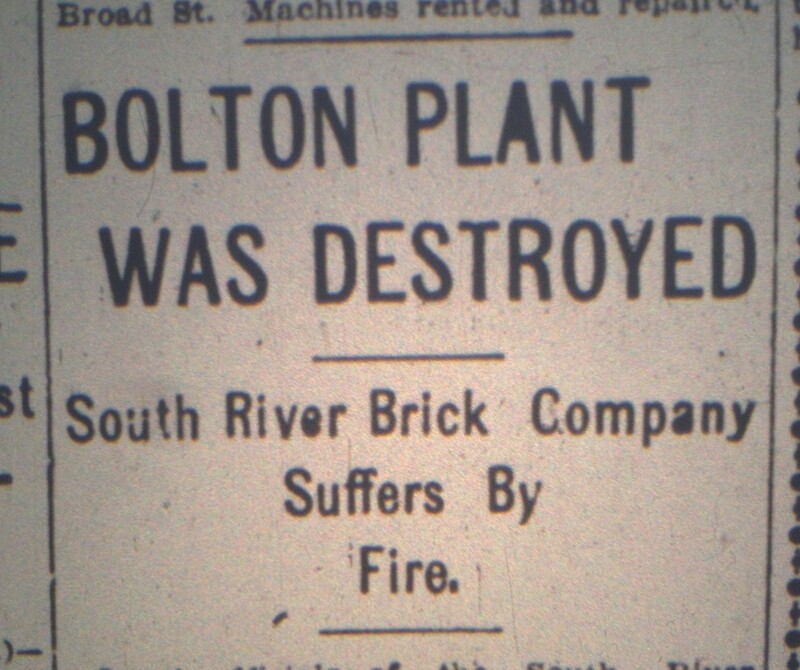 On a Saturday night in March of 1907 the South River Brick Company’s Bolton plant on the Western & Atlantic Railway burned to the ground. Gone was their 500 square foot manufacturing building, all of their machinery and several smaller buildings. In one night their ability to produce brick out of this location vanished. The Atlanta Constitution placed the value of the loss at $35,000, and only a small part of this massive loss was covered by insurance. For a short time South River Brick could only rely on their strangled location in DeKalb County to produce brick until they could recover their Bolton facility. And bad luck would hit them again, for the Panic of 1907 devalued the price of brick even further, as banks across the nation failed, loans were impossible to obtain and construction dried up. The Bolton facility never returned to full strength, and was always a shell of its former self. Financially ruined, in 1909 the owners decided to sell the South River Brick Company’s holdings in DeKalb County for $500 to Robert Dempsey, a brick mason in the area. In less than two weeks Dempsey sold half of his company to Elmore Costley for $250. It seemed Dempsey and Costley teamed up, with Dempsey providing the expertise and Costley providing the capital (Costley was a grocer on McDonough Road). It’s unclear if the pair operated the South River location under the banner of the South River Brick Company. But they struggled. Not only did Costley and Dempsey face flooding and poor financial timing, they had a powerful enemy that literally surrounded them in the Chattahoochee Brick Company. The main branch of the South River Brick Company in Bolton limped along until 1915. In June of that year they were declared solvent, with $36,000 in liabilities and $47,000 in assets. When they declared bankruptcy in late 1915 the papers listed $60,000 in land in Bolton as being their only major asset. It’s pretty clear Costley and Dempsey were separate from South River Brick, for they avoided being caught up in this chaos. Costley and Dempsey held onto the Constitution Lakes land until 1929. In that year it was sold to the Chattahoochee Brick Company, with A.A. Havrill, the company superintendent, listed as the main buyer. English had died, surrounded by his piles of convict-labor money, in 1925. By this point in time Dempsey, the former brick mason, was a prison guard. In the late 1930’s and into the 1940’s two of Chattahoochee’s workers attempted to use the Constitution Lakes land to again produce brick. 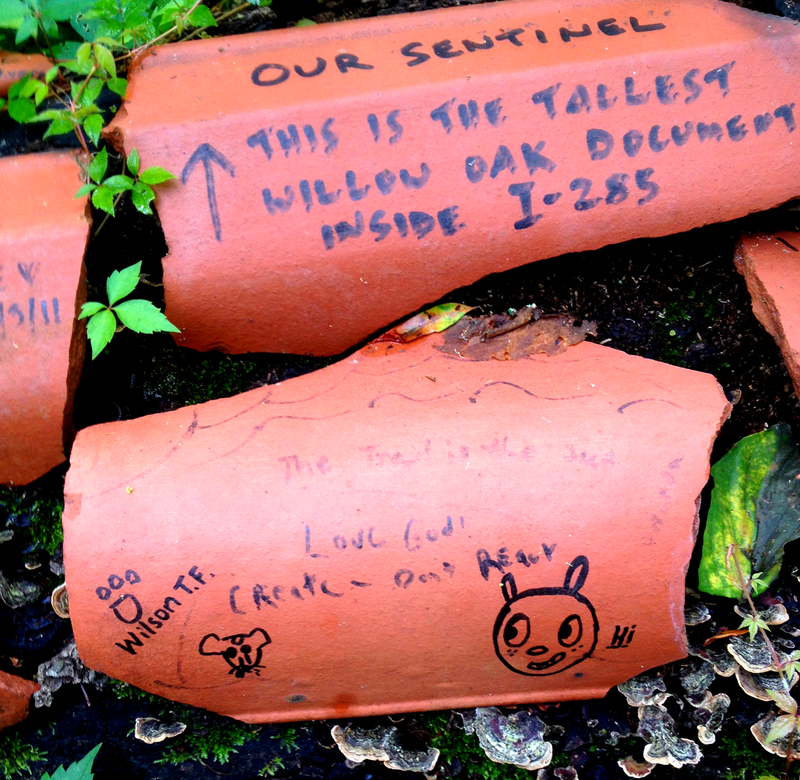 One source indicates the two men, by the names of Burns and Carol, did this without the knowledge of Chattahoochee Brick. There are footprints of a homestead on Doll’s Head Trail which could be from the pair. All accounts indicate they failed miserably. According to a local family that moved into the area in 1960, the homestead could also be from an African American family that operated a fishing operation out of the lakes. You could come out to Constitution Lakes and pay a small fee to fish; the family also operated a bait and tackle shop. At some point during the 1960’s the local whites burned this fishing operation to the ground, chasing away the African American family. A sad part of the history of Constitution Lakes that should not be ignored. 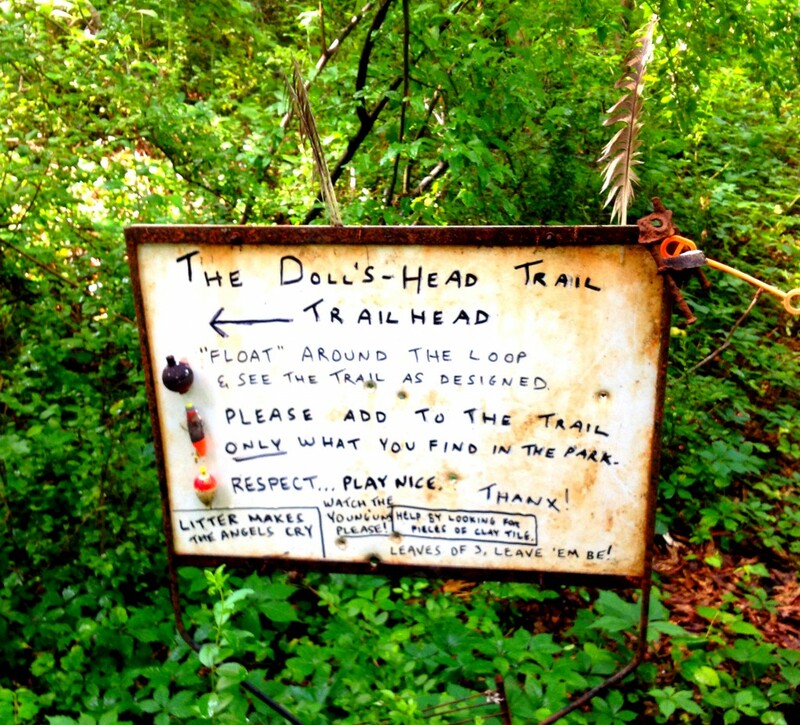 For nearly fifty years the Doll’s Head Trail section of Constitution Lakes was used as a dumping ground, conveniently located right next to railroad tracks. Trains could pull up and dump trash, leftover brick and other refuse before quickly going about their way. When local carpenter Joel Slaton first started exploring the area that is now Constitution Lakes Park around 2000 it was a favorite spot of fishermen and local ATV riders. In fact, it was the ATV riders that posed the biggest problems for the trails and the wildlife in those early days, before DeKalb County purchased the land in 2003. Slaton has been a driving force behind the restoration of Constitution Lakes into the park we see today. He calls it a Restoration Park. 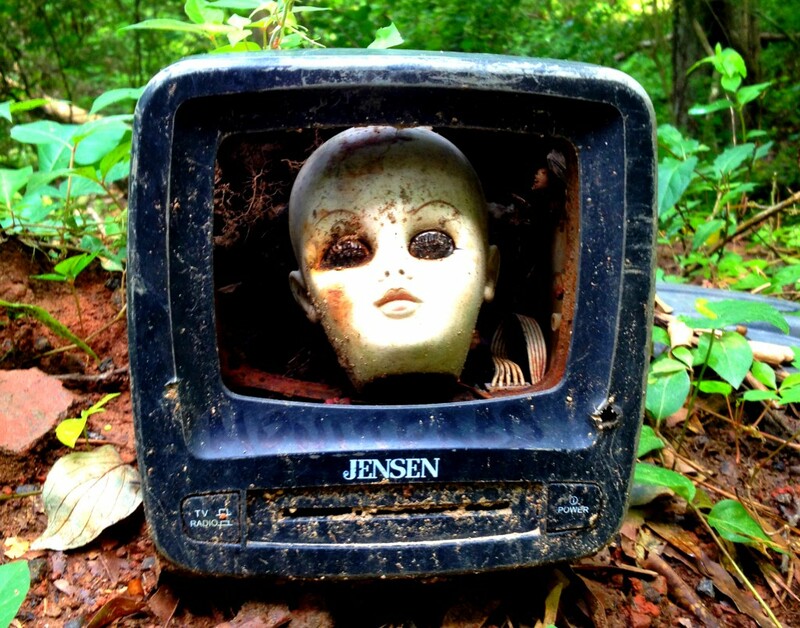 It’s Slaton that creates many of the art you will find on Doll’s Head Trail from the trash that regularly fills the land from the flooding South River. 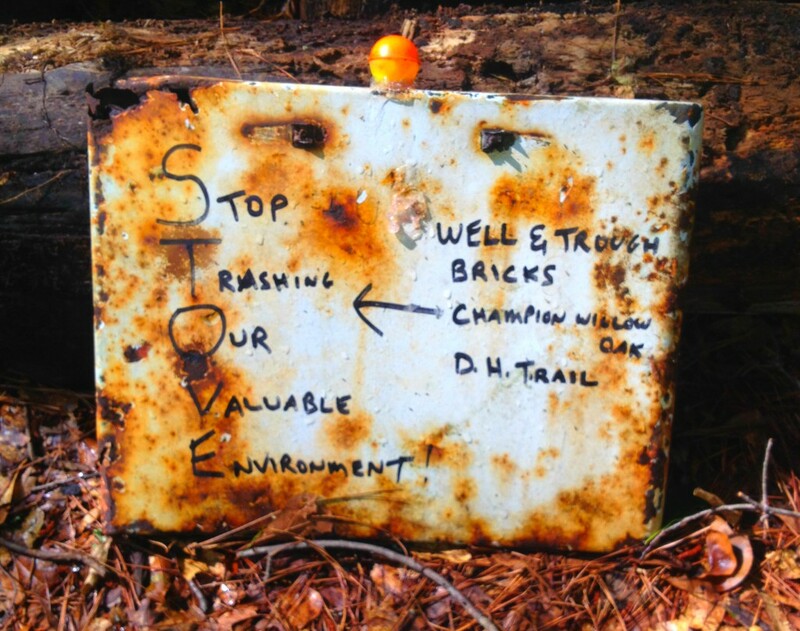 Not only does Slaton clean up tires from the South River, he leaves Sharpies out on the trail, where visitors can right down messages, poems and drawings on pieces of Terracotta tile. 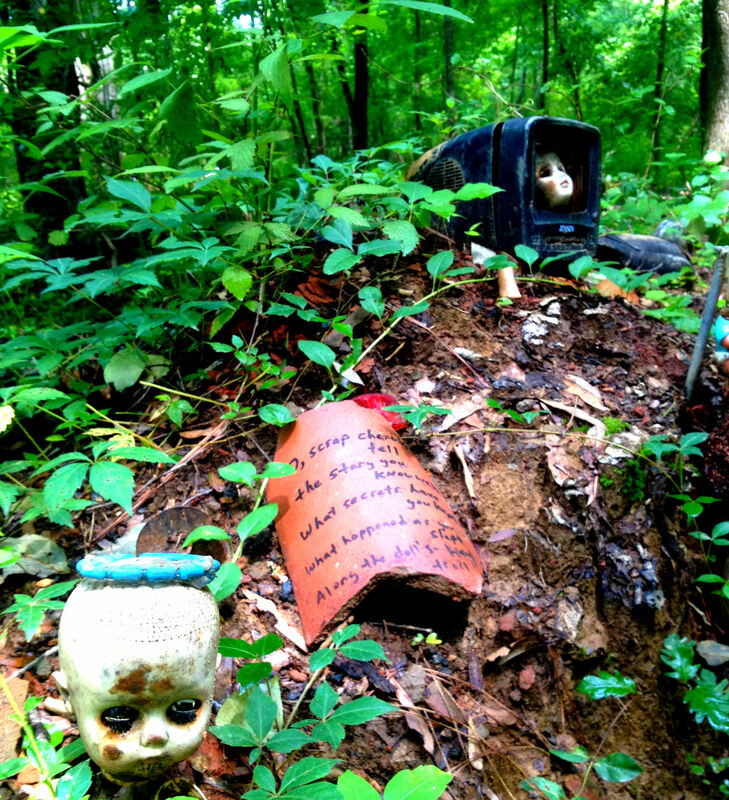 Visit Constitution Lakes Park and walk the Doll’s Head Trail and leave your mark on this special piece of Atlanta history. It’s a fun and one-of-a-kind experience. Special thanks to Joel Slaton and Joseph Peery for tuning me into this awesome park. 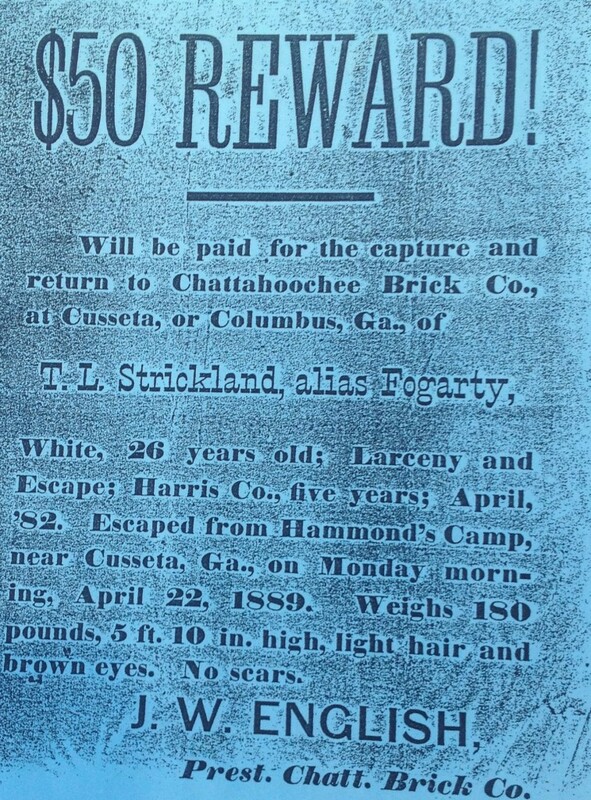 Much of the information for this article was discovered in the TRC Report prepared by J. D’Angelo, David Charles Berry’s Master’s Thesis titled Free Labor He Found Unsatisfactory: James English & Convict Lease Labor & the Chattahoochee Brick Company and old Atlanta Constitution newspaper articles. Quick Fact: Fishing is allowed in DeKalb County lakes, making Constitution Lakes a prime location for area fishermen. Quick Fact: Award-winning activist Joy Carter, Atlanta Audubon Society President, is a local Ormewood Park real estate agent. 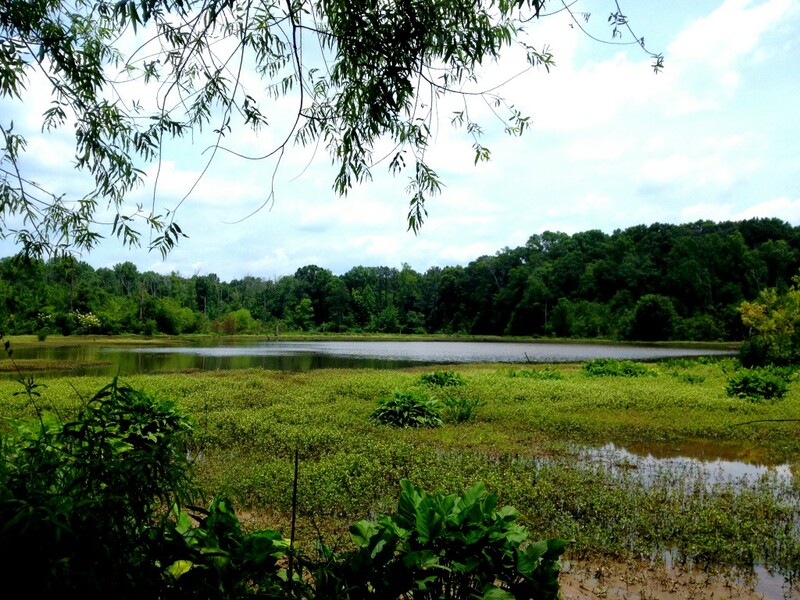 Quick Fact: DeKalb County Parks is planning many trails around the lakes, with boardwalks, observation platforms and even an outdoor classroom. 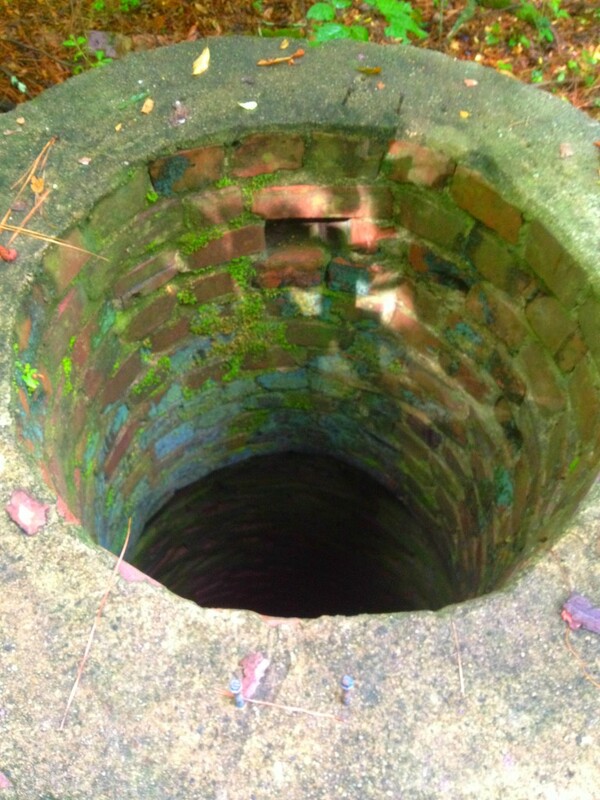 Quick Fact: Part of the deed Knapp and Cain obtained from Allen Brown stated the South River Brick Company would keep the area drained of water, an extremely hard feat in an area that floods regularly and annually receives more than four feet of rainfall. Quick Fact: At their height of success in 1904 South River Brick had a sister company under their umbrella, the Riverside Brick Company. Quick Fact: South River Brick Company had a sales office in downtown Atlanta located at 19 South Broad Street, located near the intersection of Broad and Alabama. @scottyhendo @historyatlanta @hypepotamus NOPE NOPE NOPE. This is how horror movies begin. @historyatlanta this place looks really nice. Not excited about deer ticks and copperheads, but I definitely want to visit. Wow! Absolutely fascinating. I’ve lived in Atlanta my whole life and like to think I know a bit about the interesting aspects of our city, but I’d never even heard of this area ;prior to this article. Thank you so much for the details, the history and the photos. I will be visiting it very soon! !